There are few artists in the 21st century who've been as consistently spectacular as Death Grips. 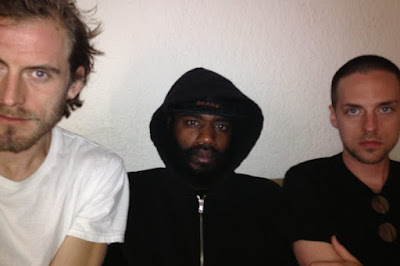 Hip-Hop's definitive experimental outfit, the trio of MC Ride, Zach Hill, and Andy Morin have continually repositioned their parameters while conserving their distinct catchiness and knack for emotional volatility. However, with the onset of 2016's Bottomless Pit and Interview, and the perpetuation in 2017's Steroids, for the first time in Death Grips' career their pattern of progression was becoming predictable. Year Of The Snitch - eerily misshapen mouths in tow - thwarts a sensible forecast by tallying every Death Grips niche since Ex-Military, jostling aesthetics like a juggler rapidly alternating his attention. No one idea levies for control as the honor of Death Grips' most disjointed and demented project bears a chapped new face. With over ten projects under their belt - side projects like The I.L.Y's excluded - Death Grips had plenty of material to scour leading up to Year Of The Snitch, a record that many of their fateful followers declared as their zenith, or even their last. The resulting project, a 13-track cacophony of sound, doesn't intend to be anything particular at all. It's perhaps Death Grips' most convivial mixture yet, a fun-loving romp that embraces their past and sets sights on an uncharted future. Ever since Fashion Week spelt out 'JENNYDEATHWHEN,' Death Grips has embraced their unyielding meme-sphere with blatant propagative material. YOTS might've been their kookiest yet, given the appearance of Shrek director Andrew Adamson on 'Dilemma,' the unsettling music video for 'Shitshow,' and the intuitive use of a tweet on opener 'Death Grips Is Online.' Suffice to say, they're self-awareness has played a pivotal role in the elongation of fan interest at a stage where most artists would be starving for relevance. Beyond the exterior gimmicks, YOTS itself features a treasure trove of musical talking points. The sprightly attitude of 'Death Grips Is Online' offers listeners a taste-testing experience, stimulating anticipation in much the same way a montage video or TV theme song would. The silly banter offered by MC Ride catapults this sensation, and will be seen later on with addictive hits like 'Hahaha' and 'Streaky,' whereas the heavily-distorted guitars guiding YOTS towards the playful Punk roots of the 90's skateboard scene help amplify other standouts like 'Black Paint' and 'The Fear.' This conglomeration offset by brazen Hip-Hop norms and scattershot Electronica. At times, like lead single 'Streaky,' Ride reels back his coarse and degraded personality in favor of customary Hip-Hop trends, hampered only by the animated synth veneration provided by Morin. 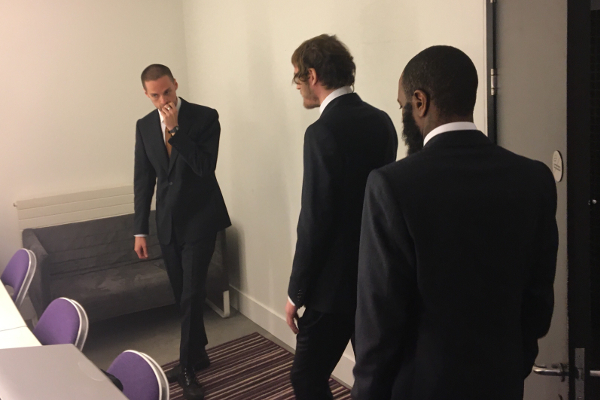 There's moments aplenty where Ride concerns himself not with the onslaught of mental anguish representative of Death Grips, like 'On GP' or 'Beware,' but rather a mischievous, almost childlike immaturity. There's choruses entirely composed of laughs ('Hahaha'), cries ('Disappointed'), and explosions ('Black Paint'), with multiple bars directly referencing feces and vomit. I mean, the cheeky Noisecore of 'Shitshow' is a literal shitshow. It's this impudent behavior that receptively counteracts, juxtaposes, or cheapens the underlying uneasiness at the heart of YOTS. When Ride's not grunting through grotesque imagery he's donning the mask of an apprehensive artist unsure of how said image will be received. The sobering pieces, like 'Black Paint,' 'The Fear,' and 'Disappointed,' directly accost Death Grips' own insecurity. Even Adamson's appearance on 'Dilemma' paints a picture of the group at an artistic impasse. With a devil on two shoulders telling him to jump, Ride's panicked screams of "I'm gonna kill somebody" on 'The Fear' harken back to the suffocating 'Black Paint' wherein he deals with "my satanic urges right now." Then there's closer 'Disappointed' where Ride attacks his greatest enemy; his fanbase. Before shrieking "why me" in a belly-up frenzy, Ride rattles off in a schizophrenic rhyme style the inadequacies of Death Grips' fans ("uninformed unit, forlorn regime / metamorph me into done for at last, at least until my present shore has passed"). Like much of Death Grips' discography, the overall identity of YOTS lies in the production, not any predominant thematic cohesion. Their peeking apprehension, also seen on the largely forgettable 'Linda's In Custody,' just adds another personal flavor to their ever-growing pot of humanism. Given Ride's occasionally-customary lyrics, the bulk of YOTS' enjoyment comes from the production Hill, Morin, and others provide. Most noticeably, it's actually DJ Swamp's regulatory scratching that gives the album its birthmark. In and throughout moments both ecstatic and somber, Swamp's intrusive scratching (seen best on 'Death Grips Is Online' and 'The Fear') help make YOTS the snappy and satisfying album it is. As with Hill and Morin's side project The I.L.Y's, YOTS also features a certain bacchanal attitude, one that transports tracks like the petulant 'Disappointed' or the freakish 'Flies' to a maniacal carnival best seen in one's nightmares. Compressing the album in totality provides the same setting, endowing listeners with the disconcerting feeling of going mad with glee. The brisk, breathless 37 minutes encourages that amplified derangement as well. On the whole, Year Of The Snitch is an incredibly talkative album, so much so that it's easy to omit similarly-tantalizing pieces like Hill's mind-blogging work on 'The Horn Section' or the topical commentary on school shootings in the cheap Tech House of 'Little Richard.' Every ounce of Death Grips' sixth studio LP comes fully-equipped with scintillating talking points. And isn't that exactly what we want from the trio?